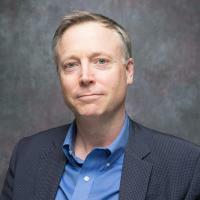 Research Description: Prof. Stephen W. Teitsworth's research centers on experimental, computational, and theoretical studies of deterministic and stochastic nonlinear electronic transport in nanoscale systems. Three particular areas of current interest are: 1) stochastic nonlinear electronic transport phenomena in semiconductor superlattices and tunnel diode arrays; 2) complex bifurcations associated with the deterministic dynamics of electronic transport in negative differential resistance systems; and 3) strategies for stabilizing negative differential resistance systems against the formation of space-charge waves. Gonzalez, JP; Neu, JC; Teitsworth, SW, Experimental metrics for detection of detailed balance violation., Physical Review. E, vol. 99 no. 2-1 (February, 2019), pp. 022143 [doi] [abs]. Neu, JC; Ghanta, A; Teitsworth, SW, The Geometry of most probable trajectories in noise-driven dynamical systems, in Coupled Mathematical Models for Physical and Biological Nanoscale Systems and Their Applications, Springer Proceedings in Mathematics and Statistics, edited by L. L. Bonilla, E. Kaxiras, and R. Melnik, Springer Proceedings in Mathematics and Statistics, vol. 232 (January, 2018), pp. 153-167, Springer International Publishing [1803.01053], [doi] [abs]. Ghanta, A; Neu, JC; Teitsworth, S, Fluctuation loops in noise-driven linear dynamical systems, Physical Review. E, vol. 95 no. 3 (March, 2017), American Physical Society (APS) [doi] [abs]. Dannenberg, PH; Neu, JC; Teitsworth, SW, Steering most probable escape paths by varying relative noise intensities., Physical Review Letters, vol. 113 no. 2 (July, 2014), pp. 020601, American Physical Society [doi] [abs]. Bomze, Y; Hey, R; Grahn, HT; Teitsworth, SW, Noise-induced current switching in semiconductor superlattices: observation of nonexponential kinetics in a high-dimensional system., Phys Rev Lett, vol. 109 no. 2 (July, 2012), pp. 026801 , [doi] [abs].